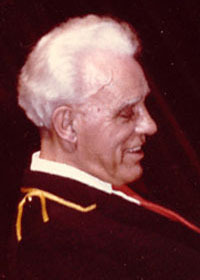 Arthur W. Delamont, the only organizer, instructor and conductor of the Vancouver Kitsilano Boys Band, was born in Hereford, England, in 1892. Mr. D. was named Vancouvers Good Citizen of the Year for 1946 and in 1979 the Governor General appointed him a Member of the Order of Canada. The Boys Band was founded in 1928, going on to win many international competitions, notably at the 1933 Chicago Worlds Fair and at a 1936 British championship at the Crystal Palace in London. In all the Band won the Vancouver Music Festival top prize 28 times and the B.C. Championships four times. The Kits Band was formally disbanded in 1974 but Mr. D.s life in music continued. He loved to lead his University of B.C. group at basketball and football games and he suffered his final heart attack during a masonic lodge Installation. Arthur W. Delamont was laid to rest in the Masonic Cemetery in Burnaby, B.C. Source: Grand Lodge record 17831. Notes excerpted from the Tribute to Arthur Delamont by Norman D. Mullins, Q.C., July 27, 1998. Also see Readers Digest "Unforgettable Mr. D," Roy Johnson with Adrian Waller. June 1983, pp. 66-70.